Cody Kabus, Lukas Guillien, Nate Bevers, and Matthew Nigh. WAEE awarded $11,500 in scholarships on April 2, 2018, at the monthly meeting held at Wisconsin Office of Energy Innovation in Madison. The 2018 recipients exhibited a variety of energy-related work experiences, career paths, and volunteer efforts. The event provided the recipients an opportunity to meet other professionals working in energy careers and to see the wide variety of careers available to them. The primary goal, of course, is to support students pursuing engineering, business and technical careers with emphasis on energy efficiency, energy management, energy conservation, renewable energy or other energy related fields. As in the past, support for the WAEE scholarship program has grown. Thanks to corporate sponsorship and membership support in 2018 a total of 6 awards for a total of $11,500 were given. WAEE awarded $9,500 in scholarships on March 22, 2017, at the monthly meeting held at McCotter Energy Systems in Milwaukee, WI. The 2017 recipients exhibited a variety of energy-related work experiences, career paths, and volunteer efforts. The event provided the recipients an opportunity to meet other professionals working in energy careers and to see the wide variety of careers available to them. The primary goal, of course, is to support students pursuing engineering, business and technical careers with emphasis on energy efficiency, energy management, energy conservation, renewable energy or other energy related fields. As in the past, support for the WAEE scholarship program has grown. Thanks to corporate sponsorship and membership support in 2017 a total of 6 awards for a total of $9,500 were given. 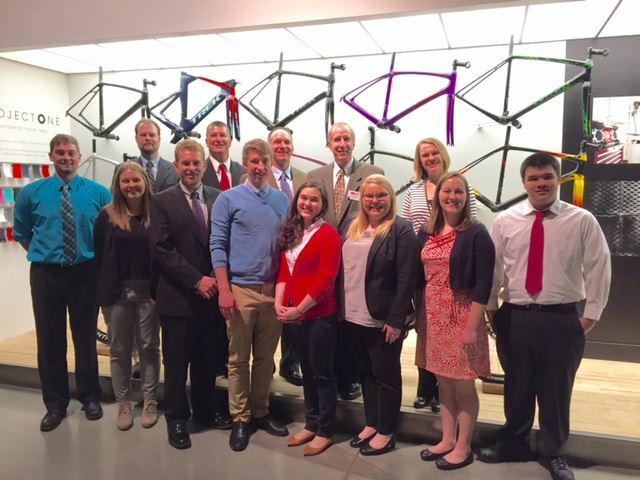 WAEE awarded $10,000 in scholarships on March 23, 2016, at the monthly meeting held at Trek Bicycle Corporation in Waterloo, WI. The 2016 recipients exhibited a variety of energy-related work experiences, career paths, and volunteer efforts. The event provided the recipients an opportunity to meet other professionals working in energy careers and to see the wide variety of careers available to them. The primary goal, of course, is to support students pursuing engineering, business and technical careers with emphasis on energy efficiency, energy management, energy conservation, renewable energy or other energy related fields. As in the past, support for the WAEE scholarship program has grown. Thanks to corporate sponsorship and membership support in 2016 a total of 10 awards for a total of $10,000 were given. 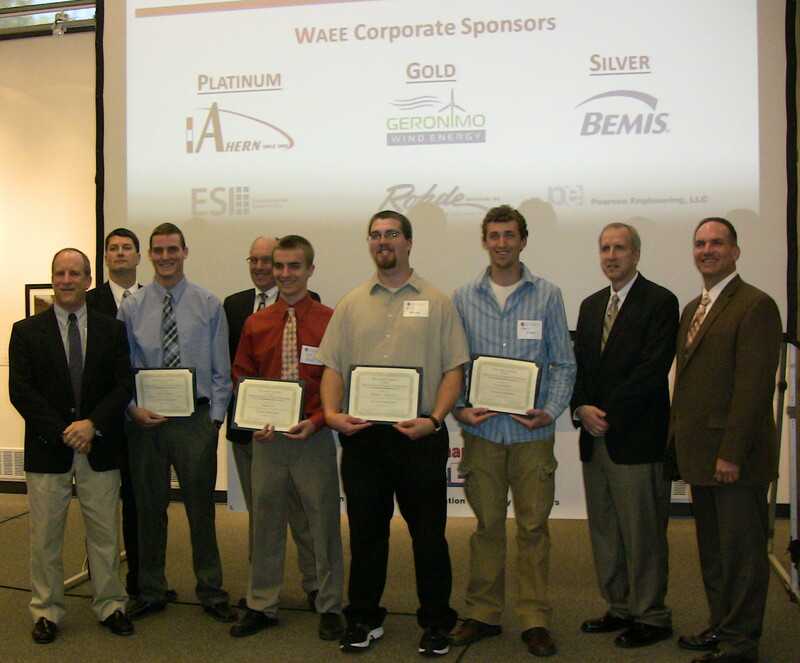 WAEE awarded $8,000 in scholarships on February 26, 2015, at the monthly meeting held at ABB in New Berlin, WI. The 2015 recipients exhibited a variety of energy-related work experiences, career paths, and volunteer efforts. The event provided the recipients an opportunity to meet other professionals working in energy careers and to see the wide variety of careers available to them. The primary goal, of course, is to support students pursuing engineering, business and technical careers with emphasis on energy efficiency, energy management, energy conservation, renewable energy or other energy related fields. As in the past, support for the WAEE scholarship program has grown. Thanks to corporate sponsorship and membership support in 2015 a total of 9 awards for $8,000 were given. WAEE awarded $7,050 in scholarships on February 26, 2014, at the monthly meeting held at the University of Wisconsin - Milwaukee University Services and Research Building. The 2014 group of recipients is truly impressive with extensive energy-related work experiences, career interests, and volunteer efforts. The event provided the recipients an opportunity to meet other professionals working in energy careers and to see the wide variety of careers available to them. The primary goal, of course, is to support students pursuing engineering, business and technical careers with emphasis on energy efficiency, energy management, energy conservation, renewable energy or other energy related fields. In 2014, the committee had great quantity and quality of applicants; 46 total applicants from five institutions. Each year, support for the WAEE scholarship program has grown. The program began with humble roots in 2009-2010 awarding $2,500. Thanks to corporate sponsorship and membership support, awards have grown each year and in 2014 provided a total of 7 awards for $7,050. Left to right: Mark Albert, WAEE Scholarship Committee Chair; Jill Vande Boom, Milwaukee School of Engineering; Michael Beeler, UW-Madison; Ryan Hettinger, UW-Platteville; Alex Arndorfer, UW-Platteville; Thomas Omwando, UW-Milwaukee; Scott Jones, WAEE Scholarship Committee; Jerry Eaton, WAEE Chapter President; Jedd Winkler, WAEE Scholarship Committee. Not photographed: Kailey Lietzke, Milwaukee School of Engineering; Ross Goessl, UW-Milwaukee; Scholarship Committee, Brian Basken & Steve Hinkens. The Wisconsin Chapter of the Association of Energy Engineers was pleased to present 2013 scholarships to five students from UW-Platteville. The scholarships were presented at the WAEE monthly meeting held Thursday, April 25, 2013 at Ullsvik Hall at the University of Wisconsin-Platteville. Left to right: Steve Hinkens, scholarship committe member; Richard Feustel, WAEE Vice-President; Steven J. Genin, recipient; Dean William Hudson, UW-Platteveille; Matt Pavlat, recipient; William E. Johnson Jr., recipient; Travis Weaver, recipient; Jerry Eaton, WAEE President; Mark Albert, WAEE scholarship committe chairperson. Not photographed: Martin Hubmann, recipient. The Wisconsin Chapter of the Association of Energy Engineers was pleased to present 2012 scholarships to seven students on February 2, 2012, at our meeting hosted by Mid-States Aluminum in Fond du Lac. Scholarship funding is proudly supported by the financial contributions of all the members of the organization. Recipients of the 2012 Wisconsin Chapter of the Association of Energy Scholarship attend engineering and technical colleges throughout the state and represent the future leaders of the energy industry. Front: Frederick C. Prehn Jr., UW-Madison, Materials Science & Engineering; Ray Wu, UW Madison, Geological Engineering and Geology; Amy Erickson, Northeast Wisconsin Technical College, Solar Energy Technology; Tyler Utecht, UW Platteville, Mechanical Engineering; Chris VanBrocklin, UW Madison, Engineering Physics. Back: Jedd Winkler, committee; Richard Feustel, vice-president; Jerry Eaton, president; Steve Hinkens, committee; Mark Albert, scholarship committee chair. Not photographed: David Newsome, UW-Milwaukee, Civil Engineering; and Joshua A. Hoverman, Milwaukee School of Engineering, Mechanical Engineering; and committee members Scott Jones, Bob Douglas and Scott Hartay. The Wisconsin Chapter of the Association of Energy Engineers was pleased to present 2011 scholarships to five students from various Wisconsin universities. The scholarships were presented at the WAEE monthly meeting held February 23, 2011 at the University of Wisconsin-Madison Hybrid Vehicle Lab.